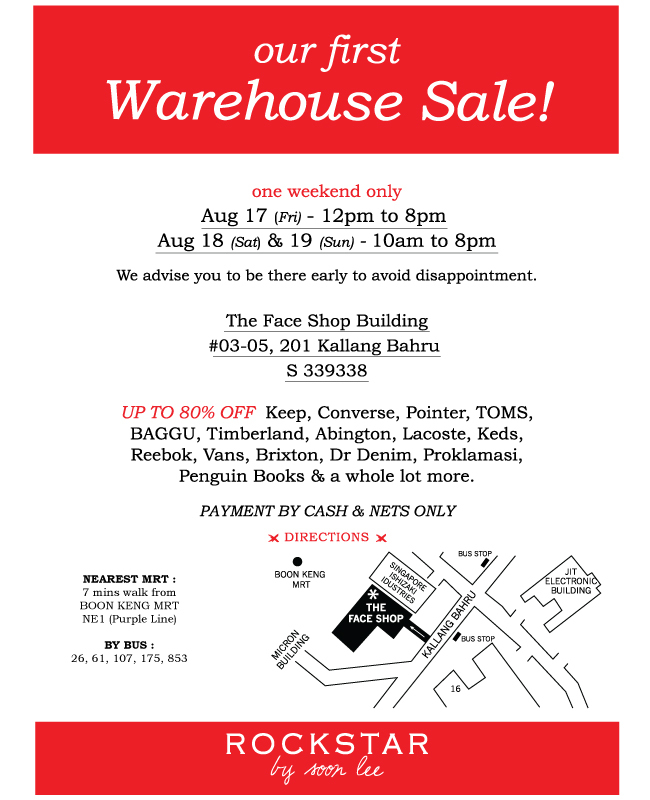 Rockstar Singapore: This Weekend Only : Rockstar's Warehouse SALE! This Weekend Only : Rockstar's Warehouse SALE! We regret to inform that our warehouse sale will be cancelled on the last day, 19 August, Sunday. Due to the overwhelming response at our warehouse sale the past 2 days, we are completely sold out, and have no choice but to officially call it a wrap. For those who were thinking of going down, please do take note. We apologize for any inconvenience caused. We don't know if you've heard the news, but our first ever Warehouse Sale (in 3 years) is just around the corner! Here's a warning - It's gonna be crazy. We are slashing prices up to an unbelievable 80% off from brands like Pointer, TOMS, Keep, Converse, BAGGU, Penguin Books, and a whole lot more. Visit our Facebook page for all the juicy details. Do take note that this will be held at The Face Shop Building #03-05, 201 Kallang Bahru and NOT at Rockstar itself.